In this tutorial, I am going to show you DIY Halloween Costume ideas for toddlers in 2017. This is part 2 and a tutorial on how to make Princess poppy costume for a toddler. It is cute, easy and affordable to make, and it is adorable DIY outfits for active toddlers. 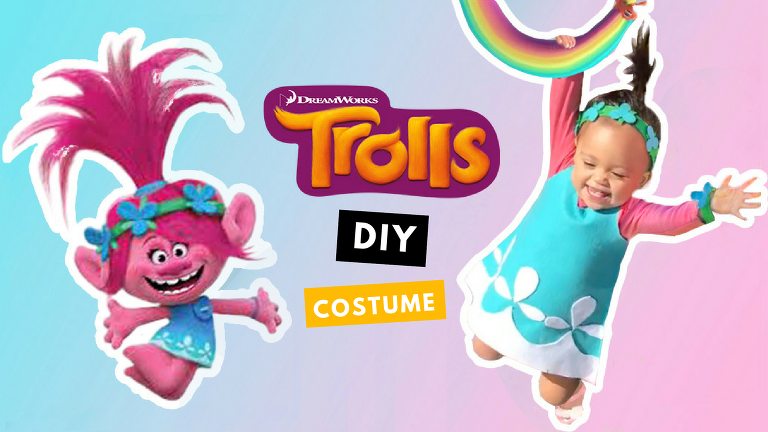 This DIY trolls costume is also perfect for busy moms as the last minute’s costume because it is very easy to make super adorable. I chose to use felt fabrics instead of cotton because there are many felt textures in the trolls movie and I was inspired to make a same soft and fuzzy look. If you want to make a costume rather be everyday wear dress, you can use cotton instead.